Side mounted hidden deck fasteners – Side mounted fasteners can be installed in two different ways. They can either be installed using “pregrooved decking” boards. (Ask you local lumber dealer to learn more about it if you are not familiar with this decking material.) Most hardwood and composite decking suppliers regularly stock pregrooved decking material. If you are not sure about your supplier contact them today and ask. 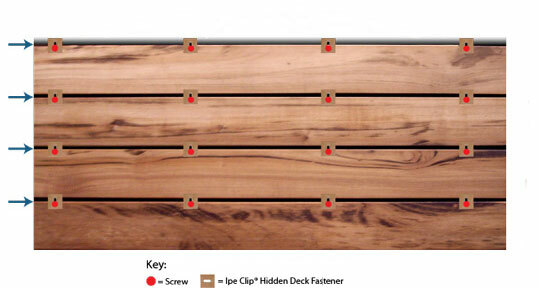 Alternatively, most side mounted hidden deck fasteners can be installed with standard decking planks. Most installers (or DIYer’s) cut slots on the side of standard decking planks with either a biscuit jointer or a router. 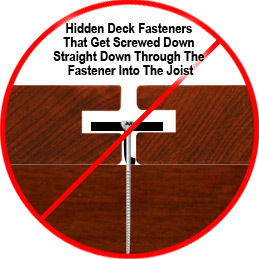 If you are installing standard decking with side mounted hidden fasteners, just lay each decking plank over the floor joists and cut a slot on the side of the board where each fastener/clip will be installed. Most side mounted hidden fasteners are installed from the TOP SIDE of the deck surface. This is the largest advantage to using side mounted fasteners opposed to underside cumbersome fasteners and makes decking installations fast and easy! As important as hiding the fastener, is how our stainless steel decking screw angles 45 degrees penetrating both the decking wood and the joist. This secures the decking for extreme hold down power and adds another level of protection against board warping from expansion and contraction. Underside mounted hidden deck fasteners – Underside hidden deck fasteners are installed using standard decking boards. This means you do not have to buy pregrooved decking material or cut slots on standard decking planks. This my save you a very small amount of time or money but this is greatly outweighed by the fact that these fasteners have to be installed on the UNDERSIDE of the decking boards. This essentially requires the installer to “stand on his/her head”. Our side mounted hidden deck fasteners are screwed at an angle through the fastener and the deck board, and into the joist. 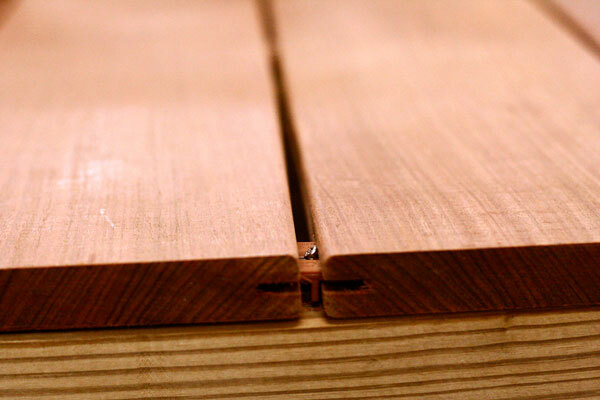 This means that the DeckWise® system pins the edge of the deck board to the joist! In the diagram above, the top of the deck board will stay straight on the blue arrow forever! The board’s other edge is allowed to expand and contract, so one edge is always aligned evenly on the floor joist. The side that expands and contacts is still held down by the adjacent DeckWise® fastener. The fact that one side of the deck board is fastened to the joist keeps more consistent gap spacing between the deck boards. 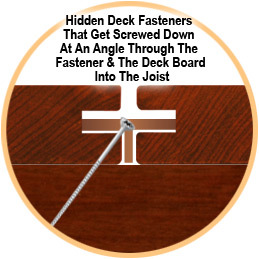 Some side mounted hidden deck fasteners are screwed straight down through the fastener into the joist WITHOUT going through the deck board. 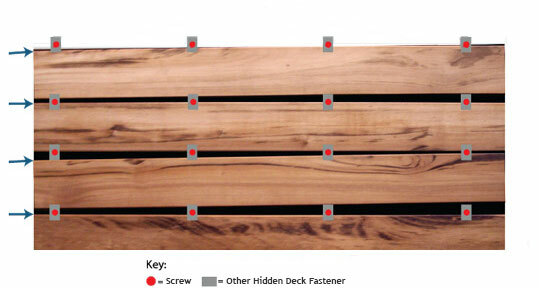 A deck that is installed with a hidden deck fastener system like this makes the deck more susceptible to uneven gaping between deck boards, as can be seen in the diagram above.